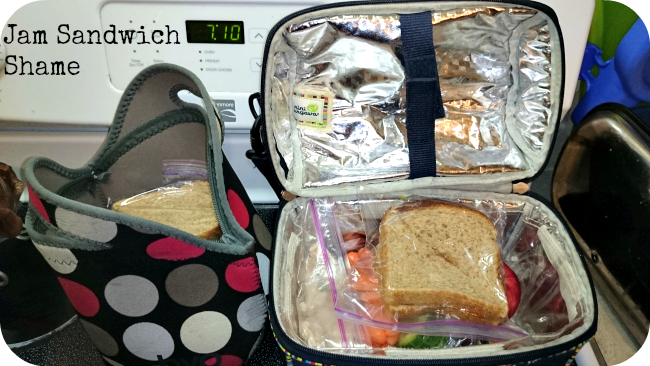 This morning I did what I do most mornings, I packed lunches for Asher, Simeon, Meghan. Lunch during the week for us is a bit of a funny meal. I come home at lunch mainly to scavenge. Ariella gets her lunch supplied at daycare. Asher’s lunch is mainly formula but we send some avocado and banana puree or yogurt too. Simeon and Meghan are the only people in our family that get a true packed lunch. Today I packed them jam sandwiches, and I hated it. 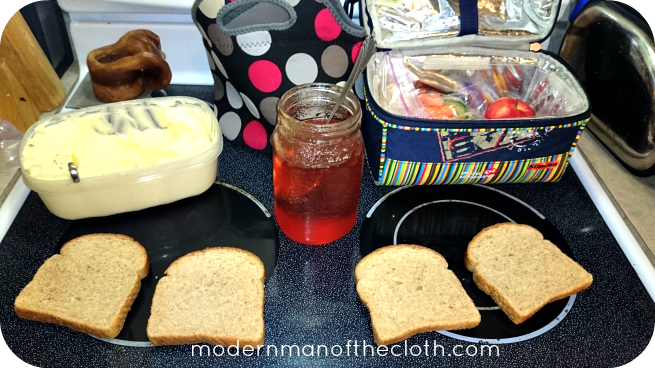 While I know for many the classic jam sandwich is comfort food. And for some it is the only food you are sure your child will eat at lunch. But that is not what it is to me. To me it simply tastes of failure. Normally I fill our lunchboxes with leftovers from previous suppers. Sometimes that is pizza, but often it is a meal I crafted with my own skill. It is paste and sauce made from my ever changing and evolving recipe. It is baked chicken drumsticks breaded with my own mixture of species with veggies. It is a homemade turkey soup. Failing that I have made packets of pepperoni, cheese, and crackers, egg salad sandwiches, even homemade ‘Egg McMuffins’. But today as I filled Simeon and Meghan’s lunchboxes I had to reach for the butter and jam. Simeon was more than happy to have it he loves the jam Grammie (my mother-in-law) made. And Meghan has asked from time to time for me to include a simple jam sandwich (she is not as enamored with my homemade soup as I am). I know they will be well be well received. But like I said to me they are a statement of shame and failure. I only resort to jam sandwiches when we have no leftovers and no other quick to pack lunch options. These two things only coincide when I have been slacking with meal planning and preparation. It means I have not been really thinking through grocery trips, but I have been buying at whim. It means I have not stopped to make good and plentiful meals that produced leftovers, but I have been making quick to eat food, or worse picking up take out. A jam sandwich tends to mean I have been taking the lazy path for the better part of a week. Jam sandwiches are supposed to be the ultimate comfort food. But I feel no comfort in making them. What’s in your lunchbox today? This entry was posted in Dad, Family, Recipes. Bookmark the permalink. I don’t like plain jam sandwiches, but I understand that you can’t send peanut butter anymore. That said, there is no need to consider these jam sandwiches a failure. The fact that you make lunch daily for almost everyone in your family is a huge asset. In our home, everyone makes their own lunch (by everyone I mean Dan and I) and usually we’re too rushed to even do that. Be proud of knowing you are nourishing your family. Thanks Laura. I am not a fan of plain jam sandwiches either, I suspect that is part of my annoyance of sending them. They never felt like a meal to me when I was a kid, and they really don’t know that I am an adult. I didn’t know that a jam only sandwich was even possible! So, is that a Canadian thing? Or is there a PB allergy and you were out of sun flower butter? I’m sorry, I know the focus is that you feel like a failure, but there will be worse days, so, I’m fixated on the sandwich with just jam… but, since I love sugar, that might be a way to sneak in a sugar high for me without the pesky protein! Our boys had pitas, hummus, veggies and clemetines with yogort for recess. We never send leftovers with them, unless it is a chicken fajita, then we make extras at suppertime. A jam sandwich is not a failure, probably something fun to have switched up every once in awhile. we are pretty quick cold lunches…veggies and fruit always, mixed with things like bagels and cream cheese, ham and cheese wraps, pita and hummus and so on. They get pizza at school once a week too. Just remember, at least you pack them a lunch! As a lunch monitor, some of the lunches I see are pretty sad. Those kids would do well with a jam sandwich! Thanks Michelle, some pitas or bagels don’t sound like a bad idea either. I just never have deli meat in the fridge, maybe it is time to break down and start buying some.